At Financial Analyst Day 2012, AMD had the usual bunch of demos out, two of which were really interesting. They aren’t new, but given the lack of exposure, we thought we would give them another shot. 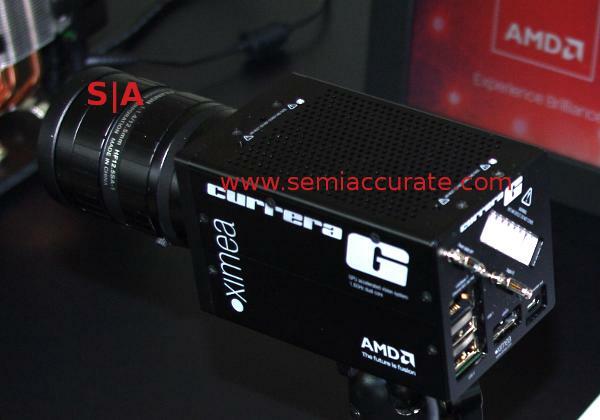 The first of these is the Currera-G camera by Ximea, a full Brazos based PC housed in a small camera. 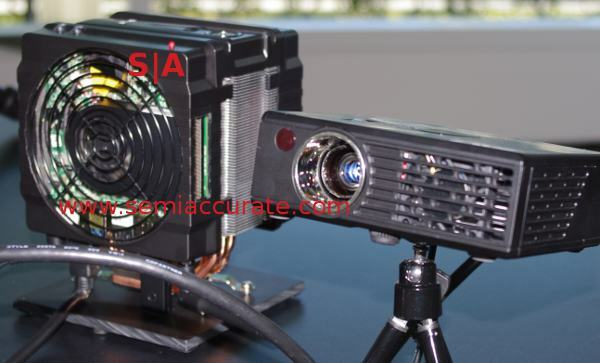 If you need a 2K * 2K 90FPS 12-bit color video camera with full PC image processing capabilities that is Ethernet powered, Ximea has the camera for you. The Currera-G camera is a serious digital film camera with a Brazos PC built in for real-time on-board image processing and whatever else you might need. The most impressive part of this camera is the size, 62 x 62 x 105mm to be exact. In that, you can get a 1.6GB Brazos PC with 2GB of DDR3/1333, eSATA, 3 USB3, and GigE ports. This is not a toy, it has enough features to keep you buried in the manual for months, and there is a full PC in there when you want to do more. 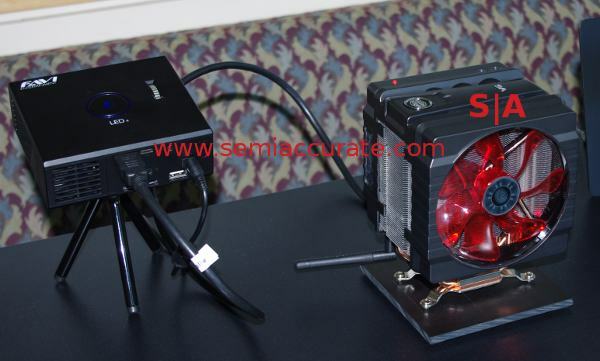 The Ximea Currera-G is a serious image gathering and processing machine in a small package. The next one is older, shown off at CES among other places. It is a CoolerMaster Hyper 212+ heatsink with a full Brazos PC built in. It has an HDMI cable running to the micro-projector next to it, and it was showing slides about the demo. Think of it as a shrinking recursive demo. From the front, you can’t tell what it is, most people looking at it scratched their heads for a few seconds trying to figure out what they were seeing. If you look at the back of the unit, two things become clear. First is that the Hyper 212+ has more than enough cooling power to keep a Brazos happy. This wasn’t a big concern, SemiAccurate has a bunch of 212+’s at the lab, and they work well on much higher TDP PCs, even when overclocked. Next is that you can see the mobo clearly enough for even the most dense onlooker to get the point.